We are less than a month away from the beginning of the meeting and everyone is getting ready: the young participants, the families who will be welcoming pilgrims and the coordination teams of welcome, prayer and morning program in the parishes. 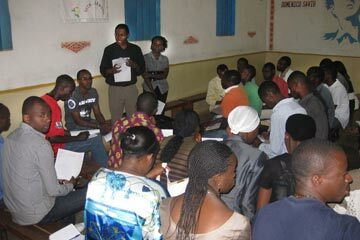 During the week, the preparation team set meetings in the parishes and one Saturday the contacts came from the parishes to the Youth Centre of Gatenga to receive the latest information, ask questions and make suggestions. On Sundays, we share a Taizé prayer with the youth from the communities. There are also parishes preparing to welcome pilgrims coming to the pre-meeting, an opportunity for the young people from far away to share daily life in Rwanda before the meeting starts. 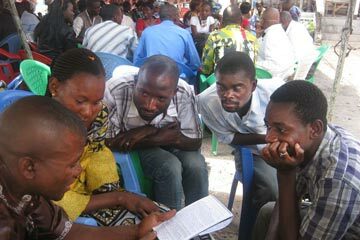 Everybody is colaborating for the preparation with the enthusiasm and the joy characteristic of the life of faith in Africa. As new volunteers arrive, the Taizé coordination team grows: we are now twenty, including brothers, sisters and volunteers, from fifteen nations, sharing common life, work and prayer. From time to time, we also have the chance to visit "places of hope" and meet people who witness to hope and joy in their daily life. Some of them work with widows and orphans from the genocide of 1994; some others dedicate their lives to disabled children and others simply cope with difficulties of life with the strength of faith. In this people, the participants in the meeting will be able to see the footsteps of the Lord in everyday life, a simple but tangible presence of the Spirit that encourges us to grow in graciousness each day. In many different ways, each one prepares the road to keep building trust and a new solidarity, specially in the days of the Kigali meeting.